Please note that this is for 1989-90 USDM 240sx. It might work for 1991-94 USDM 240sx providing that the wires are the same colors which I think they are. – JDM thermo sensor and thermo sensor plug-you might not need this but get it as a back up. I didn’t have this and it works just fine. First is the obvious. Get your worthless & ugly analog out of you car and piss on it. j/k. Disconnect your battery so you don’t fry anything. Take out your USDM blower motor sensor (hang on to it just in case you need to swap back to analog) and put the JDM one in. This is located just underneath your glove box. Hook the USDM harness up to it. Then plug the two large white USDM harnesses up to the corresponding harnesses from the JDM Digital harness. 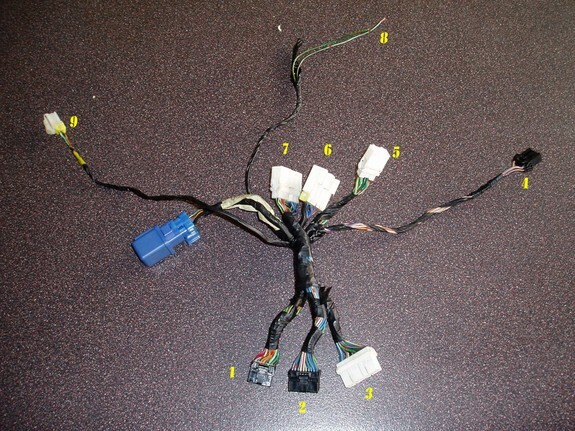 On the JDM harness, there is a 6 or 7 wire harness. the red wire from that harness has to be connected to the red/black wire from the USDM radio harness. That is your BAT+. The green/white wire must be spliced into the blue/orange wire on the USDM harness. That is your IGN+. Then from the USDM harness, the red/yellow wire has to be grounded to the chassis. I used the black wire from my radio which is grounded just behind my radio. Yours might be the same. NOTE: If you wanna keep your analog unit, just in case, attach a male spade connector to the red/yellow wire. That way, when you want to plug the analog back in, just attach a female connector to the wire that you grounded and hook them up. The blue/red wire from the 6 or 7 wire harness has to be spliced into the blue/red USDM blower motor wire. Next, UNPLUG the factory USDM fan relay which is taped to the brown harness just to your heat box. Look underneath your drivers side dash and to the right and you’ll see it. NOTE: If your JDM harness has no sensor then leave this in place. Next, you wanna run your sun sensor up behind underneath the dash on the passenger side up through the vent by the windshield. I took my vent off, by popping it out with a flat head screw driver, and took a cigarette lighter and burned where I wanted the sensor to be. Once it got hot, I took a knife and stuck it through where I had melted the plastic and just turned the knife in clock-wise motion until the hole was big enough for the sun sensor to go through. I have absolutely no idea where the ambient air temp sensor is suppose to be mounted or what wires and where the wires are located to hook it up to. If anyone else knows then feel free to reply. Next if you want to be able to adjust the temp then you need to install the JDM temp motor. First you need to do the near impossible and take off both black boxes behind your dash. Follow that stupid plastic and metal cord back until you see where it goes. That’s where the JDM motor has to be installed. The JDM mounting brackets are different so you can either make a new bracket or bend the JDM one back until it lines up with the mounting holes. I chose not to do this because I didn’t feel like taking my dash off to get the proper space that I needed. I was already frustrated enough. My misery is your benefit. The harness for this motor is located on the JDM Digital harness. Plug it up after you mount the JDM motor. After that, put everything back on, plug up your JDM digital unit and put it back in. You might wanna test it first before you do any of this but if you followed directions like we were ALL taught in grammar school then you should be okay. Next plug up your battery and you’re good to go. I hope this helps out a lot of frustrated people out there. I had almost no help with this so consider yourself lucky. Remember that this is for 1989-90 USDM 240sx. I have no clue if it’s the same for 1991-94 USDM 240sx. Try it out and see. Life is about trial and error. (cough) I wouldn’t know anything about that!